Filling the Sambódromo with colorful costumes, iridescent floats and plenty of energy, the first six of Rio’s Special Group samba schools performed on Sunday, February 26th. RIO DE JANEIRO, BRAZIL – Six samba schools from Rio’s Grupo Especial (Special Group) performed last night, Sunday, February 26th, in the Sambódromo. 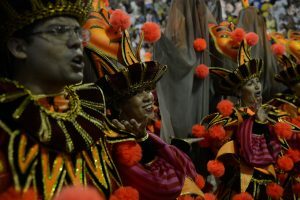 Paraíso do Tuiuti, Grande Rio, Imperatriz, Vila Isabel, Salgueiro and Beija-Flor all competed in the first of two nights in Rio’s 2017 Carnival parades. Grande Rio perform in the Sambódromo for Rio de Janeiro’s 2017 Carnival parade competition, photo by Fernando Frazão/Agência Brasil. Although the evening had a shaky beginning with the worst accident in Sambódromo history, schools continued to parade with a wide range of topics from Dante’s inferno to conservation battles and land rights for Brazil’s indigenous people. Having climbed up to the Grupo Especial after winning the Série A championship last year, Paraíso do Tuiuti began the evening with a tribute to Brazilian musical movement tropicália. But due to the evening’s earlier rain, one of its allegorical floats crashed into Sector 1. Twenty people were injured in total, including four people who had to be hospitalized. Paraíso do Tuiuti and the Independent League of Samba Schools (LIESA) offered their apologies, and have launched an investigation into the incident. Grande Rio were the next school to parade, telling the story of Brazilian pop legend Ivete Sangalo’s career. Sangalo performed first with the school’s front commission, and later with travelled through the Sambódromo on the school’s final float. Imperatriz Leopoldinense’s controversial performance came third, voicing the tale of Brazil’s Xingu tribes and the threats they face with land rights, conservation and sustainability. When the enredo was first announced, the school received severe criticisms from agribusiness moguls but has since been adopted by environmental activists. 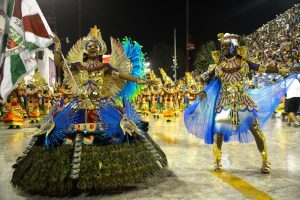 The fourth samba school to perform was Vila Isabel, telling the story of black cultural influences on musical genres in Latin America, the Caribbean and the U.S. Beginning with the front commission showing the arrival of African slaves in the Americas, the school’s enredo celebrated the profusion of musical genres and influences through its costumes and different styles of dance. Salgueiro performing on Sunday, February 26th, photo by Fernando Frazão/Agência Brasil. Salgueiro performed next, bringing the audience through hell’s circles to heaven with an allegory based on Dante Alighiere’s ‘Divine Comedy’. The school’s infernal features included chimaeras and devils, while its paradise featured butterflies and flowers. Beija-Flor was the final school to perform on Sunday evening, parading through the Sambódromo as the sun rose. The legend of Iracema formed the school’s enredo this year, telling a tragic love story between indigenous Iracema and a European coloniser and the birth of Ceará state. The second night of Carnival 2017’s Grupo Especial competition begins tonight from 10PM, with the final six schools parading through the Sambódromo. União da Ilha will begin the evening, followed by São Clemente, Mocidade Independente, Unidos da Tijuca and Portela, with last year’s champions Mangueira to close the competiton.